This conversation is between Blacklanderz Vida and Iris. Iris has not read the book. Edited by Vida. We also inserted parts of an interview Variety had with Sam, Tobias and Cait that shed insight into their characters this episode. Vida: This episode had it all! I will have to start paying more attention to the title cards. 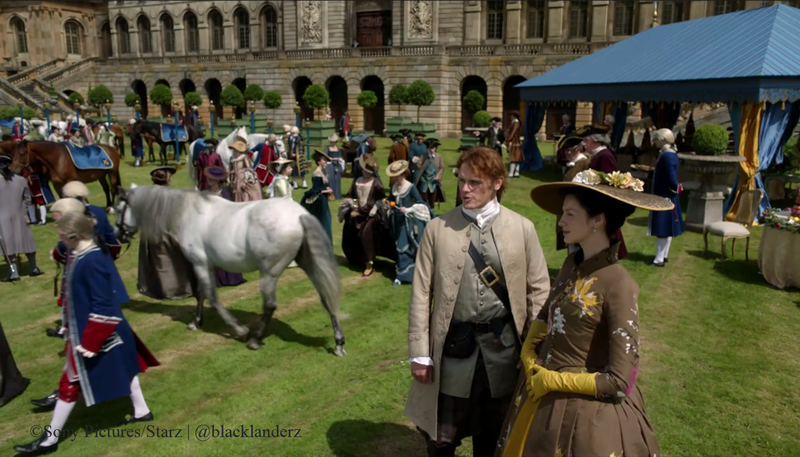 This episode starts with a horse, apparently in Versailles; and as we find out later, major things happened there. This might have been my favorite episode thus far. There were tender moments between Jamie and Claire, Jamie and Murtagh, and Alex and Mary. 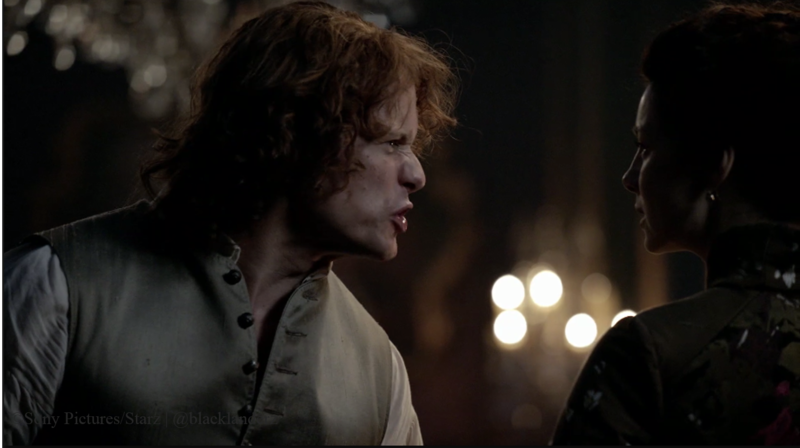 This episode also had intense scenes between Jamie and Le Comte; Black Jack, Claire and Jamie; and finally Jamie and Claire. With Bear McCreary’s music, Terry’s costumes, Jon’s set designs, Richard’s writing and Douglas Mackinnon’s directing, all were at the top of their game. And yes, Black Jack is back, dammit! Iris: The title of the episode sums it all up; yet, I can’t help feeling that the return of Black Jack Randal was more timely and untimely. After all BJR is Jamie and Claire’s main protagonist. 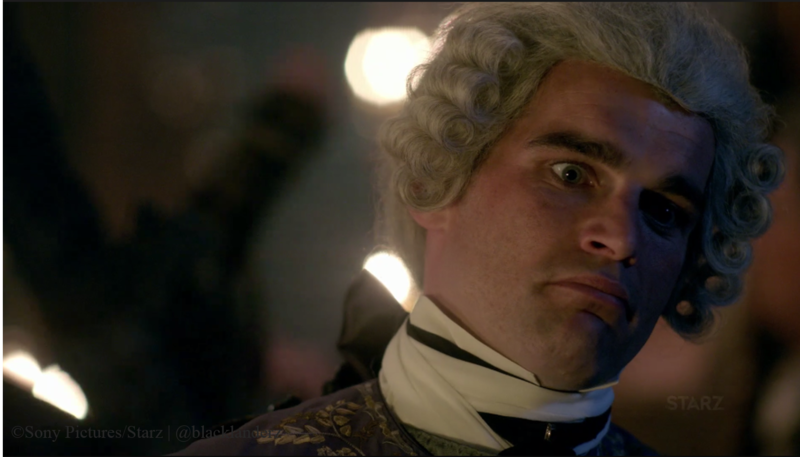 The Comte has yet to rival (or has he) the villainous of BJR, but he does come pretty close. 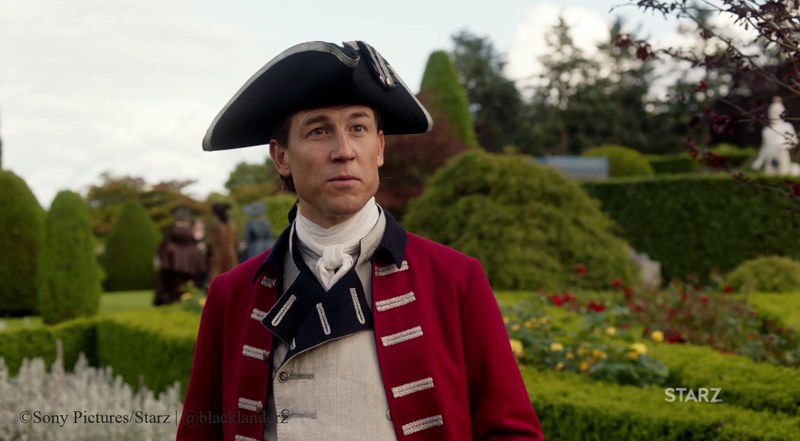 As much as I hate BJR, it was wonderful to see Tobias Menzies in all of his villainous glory! 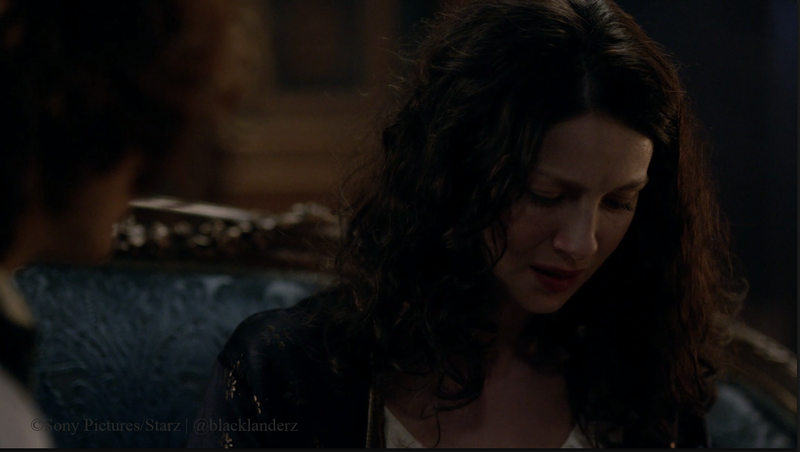 The scenes between Claire and Mary and Claire and Alex were heartbreaking. However, Richard Kahan’s writing of this episode was wondrously compassionate, exciting, suspenseful, revealing and full of dread! V: So,the episode starts with the aftermath of the brawl; Jamie’s been arrested and Claire is waiting up for him to come home. I hadn’t realized they had done so much damage. I bet Jon Gary Steele was cringing during that scene. I: What I loved most is that Jamie and Claire are a dynamic duo, who will not let a scuffle and arrest deter their plan to change the future. 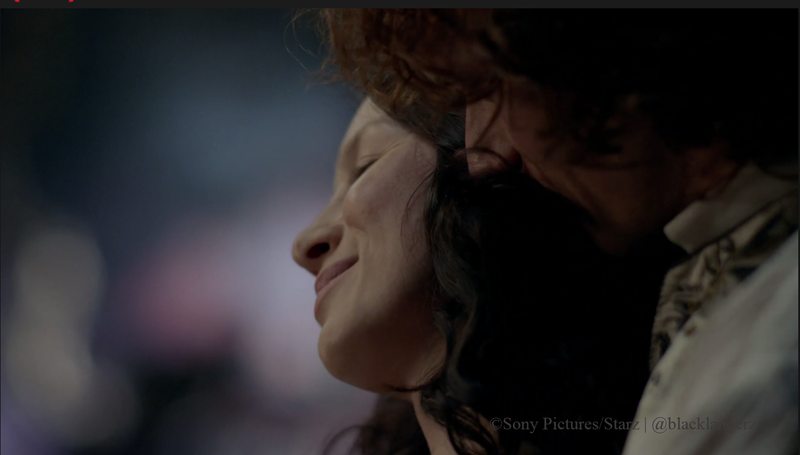 V: That was such a sweet and tender moment between Jamie and Claire. To see Wee Fergus had tried to stay up, protecting his mistress, was too precious. And, now his watch begins. V: Lord knows this is the calm before the storm. Felt like a setup . . . don’t get too comfortable! V: So glad they didn’t decide to drag out what the name meant and how they knew it was Claire. The expressions on Jamie’s face were priceless. I was initially perturbed by Claire’s reaction that Jamie had spread the rumor at Maison Elise; but damn, it saved her life. Glad she realized it at the end. I: I was surprised that Jamie sowed the seed for people to think she is La Dame Blanche and that this may be the clue to who attacked Mary, Claire and Murtagh. As for Les Disciples, why would French aristocrats prey on people in the street? V: Hmmm, well, I can’t tell you right now. You will have to keep watching. I believe more will be revealed in the next episode. V: Though there were several between Claire and Jamie, I really liked the ones at the beginning of this episode and the one after she reconciles that Jamie might have saved her life with his sorcerer rumor. V: I felt so badly for Murtagh feeling guilty for not being able to protect Claire and Mary and for what happened to Mary. He was probably thinking that he not only let Jamie down, but also Ellen! 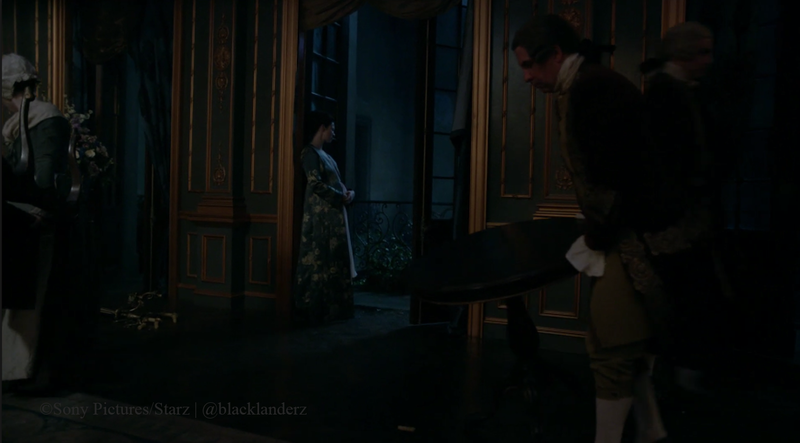 V: For what all that was going on in this episode, I loved that they chose to put Jamie back in his kilt! It appears that he is returning to himself – that played out throughout this episode. I: Yes, that also surprised me how quickly Jamie has matured, becoming an international man of intrigue and businessman. 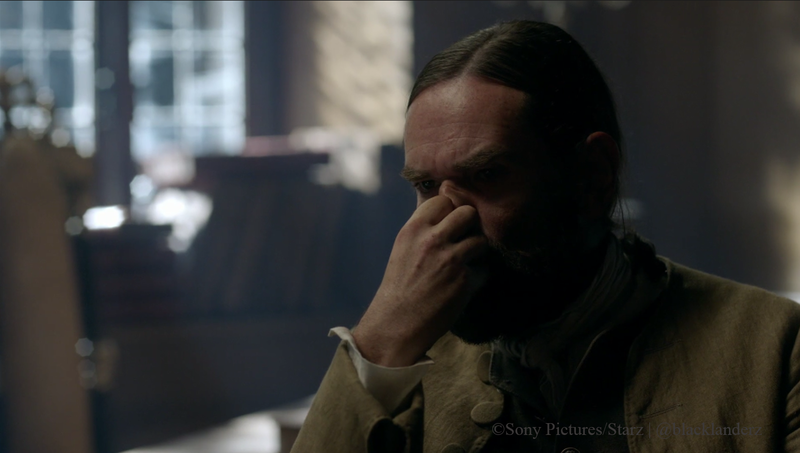 V: How many times has Murtagh had Jamie and Claire’s back? Yes, too many and this time is no exception. 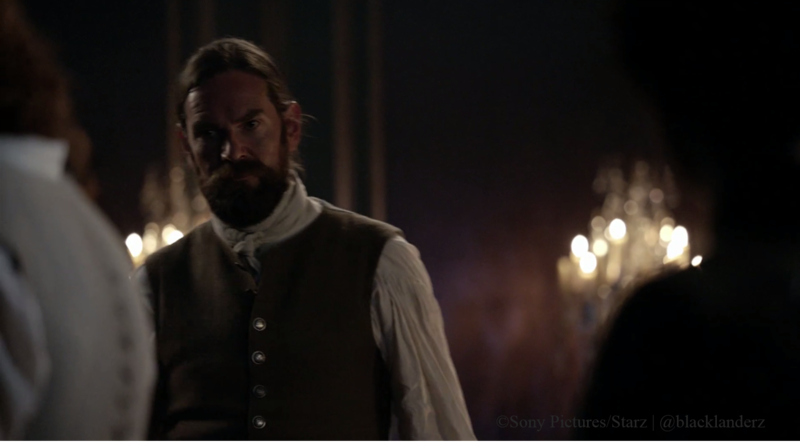 Just the transition in Murtagh body was enough and then he pledged fealty again to Jamie! I love it! I: Too many. I love the depth of his devotion to Jamie though. V: Since Mary is not one of the main characters, I know they won’t spend as much time discussing her attack and mental state, as they have with Jamie; so, I was glad that she spoke honestly about how she felt and her outlook on life. Though it broke my heart for her and Alex. 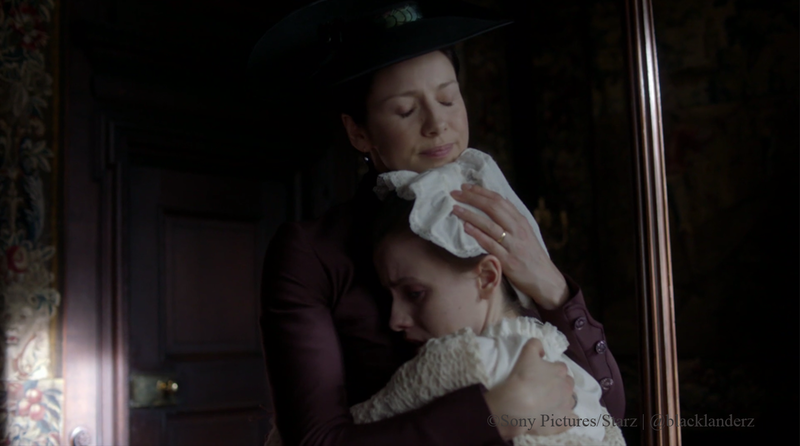 I: The scenes between Claire and Mary and Claire and Alex were heartbreaking. Mary and Alex do not deserve the misfortune that has befallen them. She is charming despite her circumstances and is willing to stand up for Alex. V: I just hated that at every turn, Claire was trying to sabotage everything for the sake of Frank – meddling with Alex and Mary’s life. What a paradox: trying to change the future one moment, then trying to preserve it the next. When reading the book, this is what exhausted me the most with Claire. Well that, and that she doesn’t exactly have all the facts. I: I know. If they realized she was meddling in their relationship, I can’t help but wonder if they would see her as a selfish busybody. I also must admit that on the one hand, I adored Claire’s compassion for Mary and Alex, despite her decision to ensure that Mary and Alex don’t become a couple. However, on the other hand, I detest her willingness to sacrifice Mary’s happiness with Alex to ensure Frank’s future by condemning Mary to a marriage to the sadistic BJR. After what BJR did to Jamie, I don’t think I could spare him to ensure Frank’s future. V: I didn’t like that part either and it always bothered me. 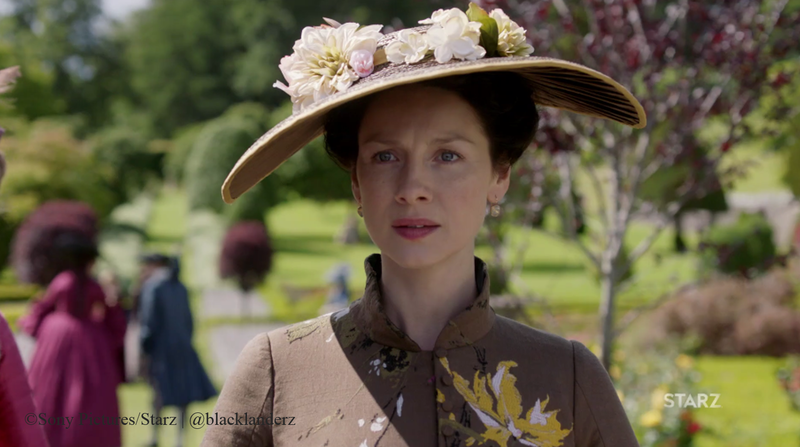 When Claire thought Black Jack was killed at Wentworth Prison, she never said anything about Frank’s lineage. Now all of a sudden, that’s the most important thing – to make sure he has one – at the expense of Mary’s happiness. I don’t know anything about time traveling, but her constant interfering (outside of the rebellion) could have easily changed the course of history in a very bad way; and she never once considers the consequences of her actions! I: Alex Randall, can he really be BJR’s brother? And his illness? Why doesn’t Claire try to heal him? V: Yes, he is and obviously got all of the sweet, compassionate and charming traits his brother lacks. As not to spoil anything for you, all I will say is that there isn’t anything she can do to heal him at this point. However, she will assist in the upcoming episodes. I: The cunningness of Prince Charles to align with the Comte, even though he knows he can’t be trusted. He is determined to restore his father to the throne of England. No permanent friends or enemies when it comes to business. The Comte is such a delicious villain. 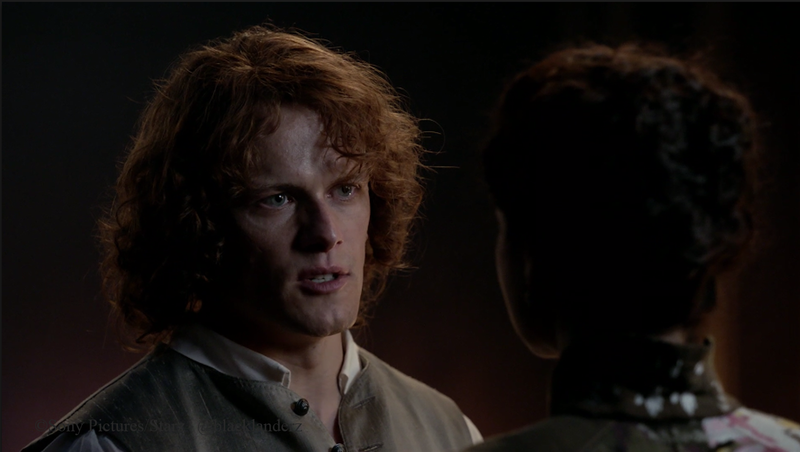 His disdain for Jamie and Claire is so obvious no matter what he tells Jamie. I can’t wait to see how they will try to destroy the his shipment of Madeira. V: The Prince has total delusions of grandeur, for sure. As for the Comte, I agree with you. 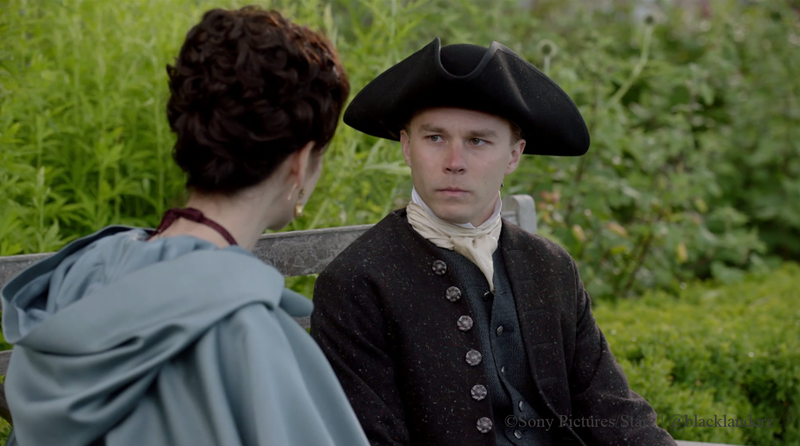 His disdain also shows when he constantly speaks French to Jamie, or rather refuses to speak English; while Jamie only speaks English to him. It’s like watching a cockfight with languages. When I find the man responsible, he will die a very slow and painful death. Yeah Comte, you’ve been marked! 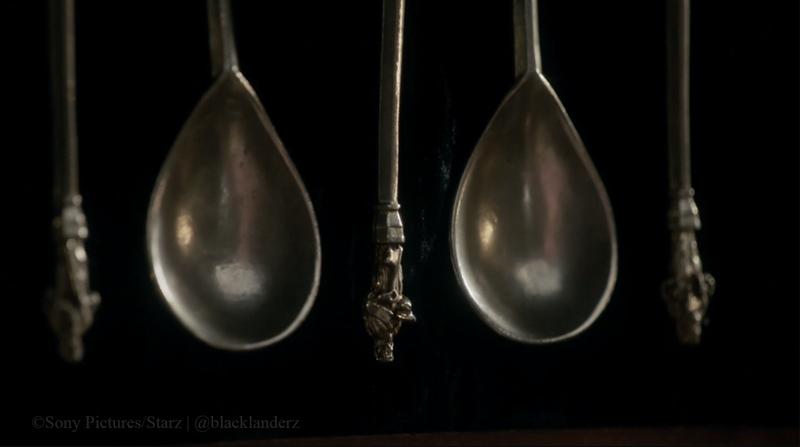 V: OMG, when Jamie gave Claire the 12 Apostle Spoons as a christening gift, for some reason, I had tears in my eyes. It was a really touching scene. Remember when they were married, he gave her his mother’s pearls. Where are those pearls? And then, Claire revealed that she wasn’t sure if she would be a good mother. Very touching. It was as if she was running through a checklist or something to see what her score was at the end; while Jamie, with his understanding self, just let’s her talk. I: Hmm, I don’t know about the pearls. But that gift did surprise me. I didn’t expect anything like that. I loved the way he presented them to her and how he reassured her that they would learn to be parents together. I know how to deliver a baby. How to feed one. How to take care of one when it’s ill; but, that’s not being a mother. I only have a vague memory of my own mother, nothing really to guide me. 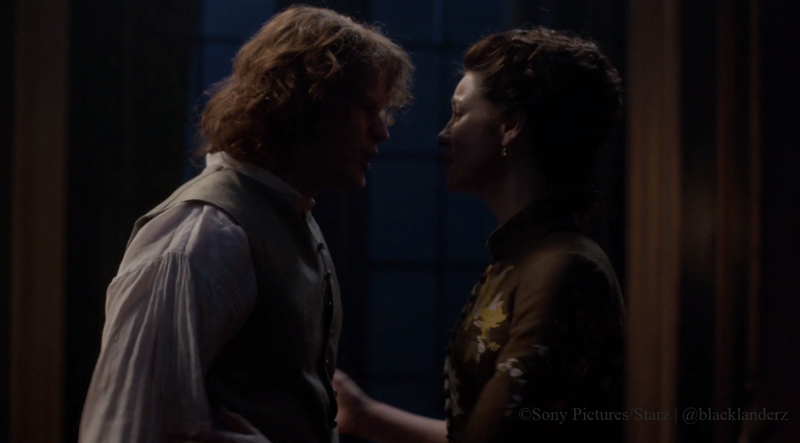 V: Wow, we finally hear Jamie call her Mo nighean donn again – so, endearing. We haven’t heard that since their wedding night. Such a nice touch in the dialog. I love the continuity of the writers. I: This was another surprise for me. 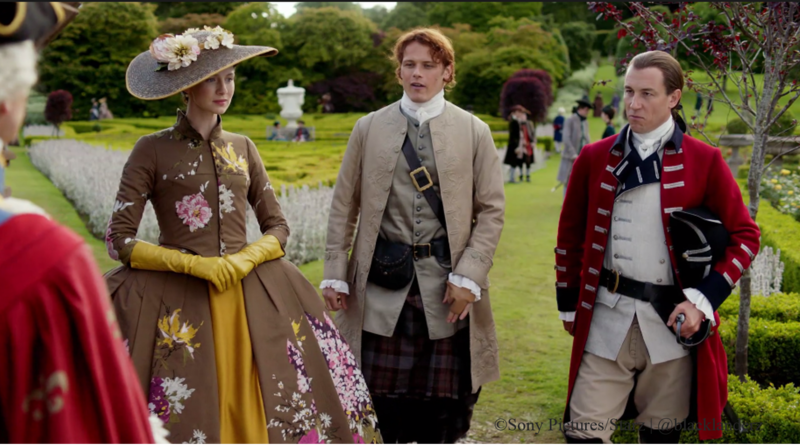 Jamie’s representation of the Apostle spoons to Claire and his reassuring Claire that she they will learn together how to be parents to the bairn Fraser. V: Wow, I had no idea how massive Versailles and the grounds were for the show until they panned out and provided that wide shot. It damn near looks like the real one. Just incredible set designs and costumes for this episode. V: Every episode, there is always a favorite costume. 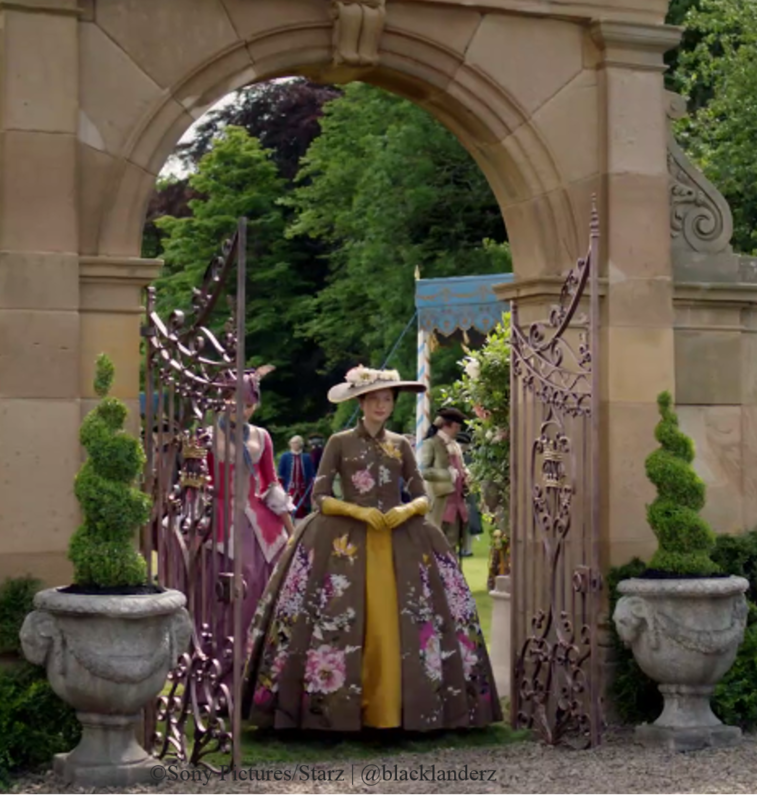 And, the winner for tonight was the one she wore to Versailles. Surprisingly, I usually don’t like brown – clashes with my skin tone – but with the pop of yellow, it was beautiful! 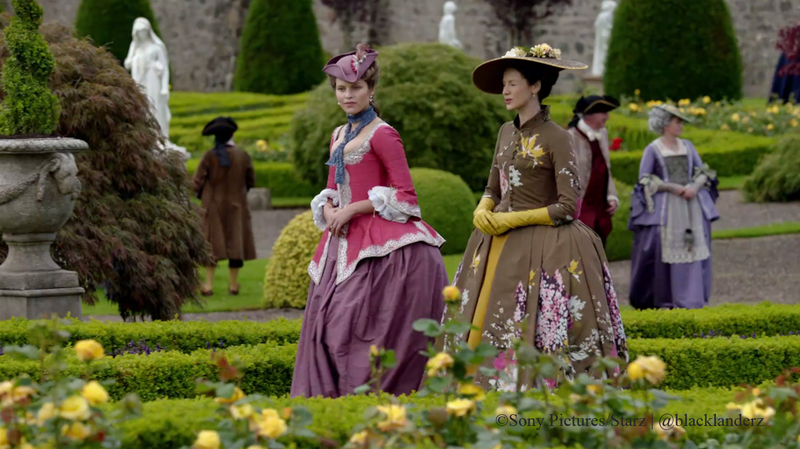 We love that Terry and crew make sure Claire and Jamie’s costumes match perfectly. Love Jamie back in his kilt! 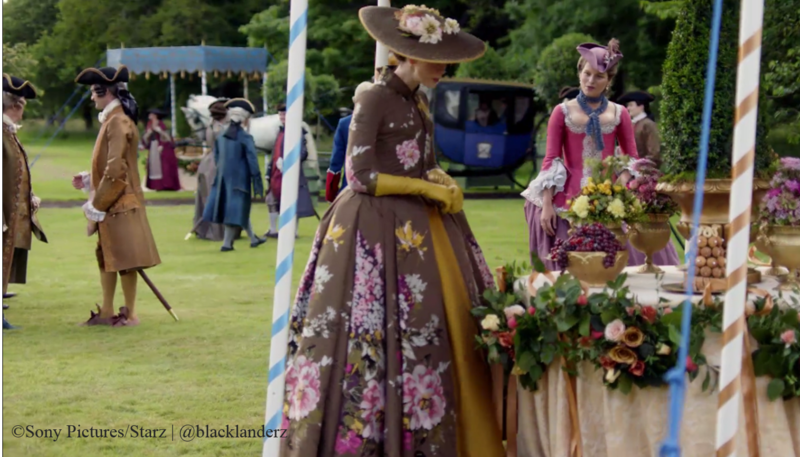 I: Have you noticed that Claire’s dresses outshine all of the other women? I keep thinking 35% goes a long way; she and James must be spending all of their money on their clothes. V: Yes, I think I remember Terry talking about that in an article. She mentioned that Claire needed to stand out, but the others should also have quality costumes, just not so grande. V: I was seriously in a Game of Thrones mood last night. Some of these folks need to be killed off, starting with that snake of a Duke. Always playing both sides to the middle because he likes options! 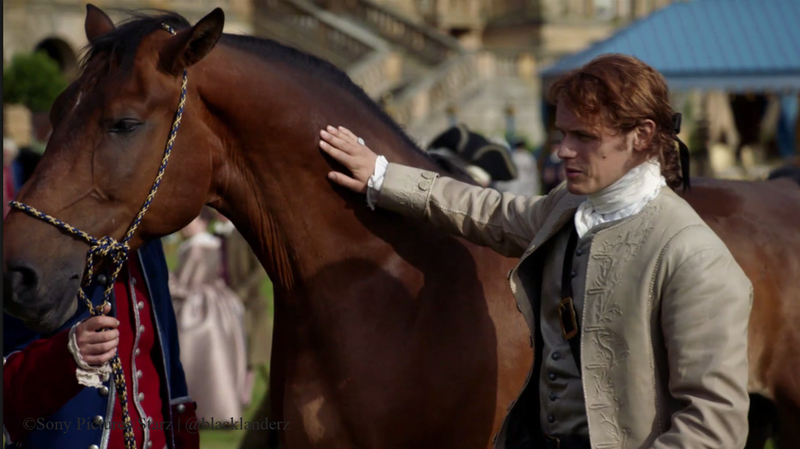 Interestingly, he kept trying to get information out of Jamie, while Jamie continuously focused on the task at hand, helping select the right horses to purchase. I: I was thinking the same thing. Jamie is working overtime to ensure that he keeps his enemy, the Duke, close. I couldn’t help thinking that the Duke of Sandringham was appraising Jamie the same way that Jamie was appraising the horses. He was looking Jamie up and down as if he would love to ravish him. Jamie better hope to never be alone with The Duke in close quarters! V: They’ve been in closed quarters before. I think the Duke knows better! V: Okay, what was Annalise trying to pull? She just kept talking about, when I knew James . . . blah, blah, blah. Jealous much, Annalise? You knew the boy; Claire has the man! I: Yeah, I caught that bit of sarcasm in Annalise’s voice during her walk in the garden with Claire. 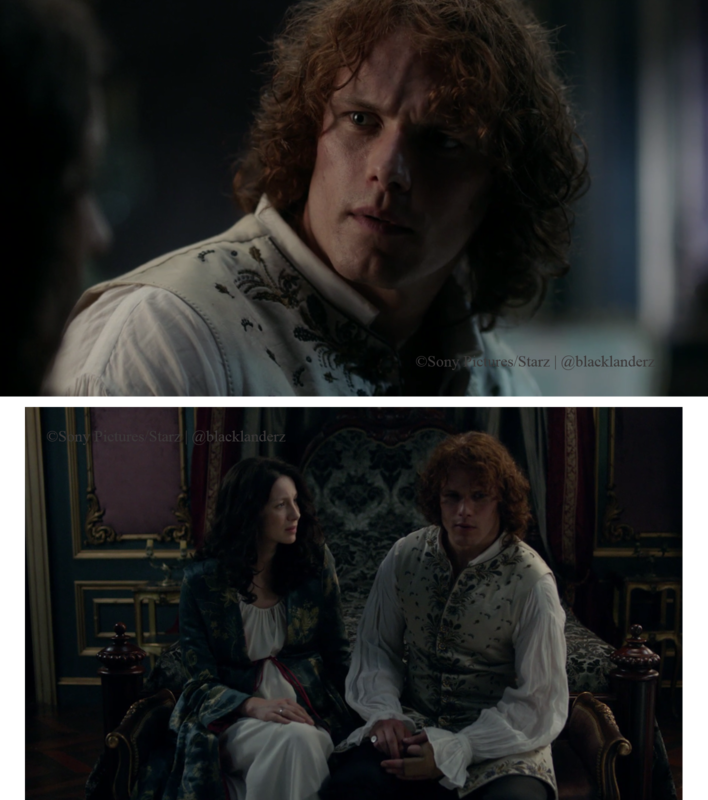 She seemed to be perplexed about Jamie’s maturity and marriage to Claire. 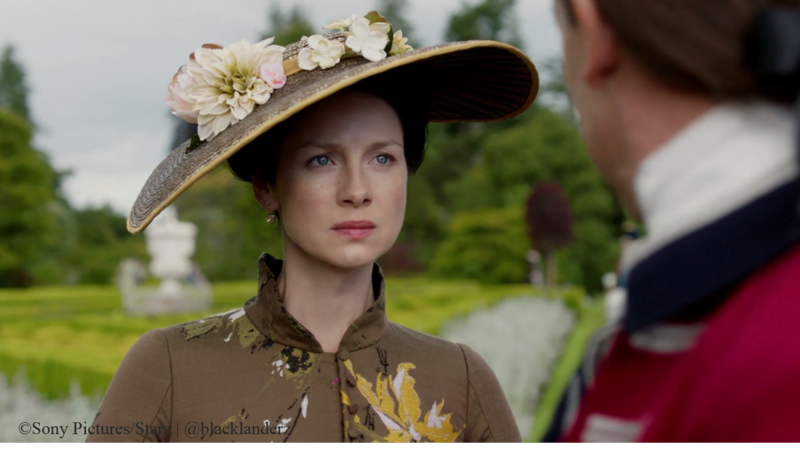 And the shade she threw at Claire – When I knew him he was a boy, you’ve turned him into a man. 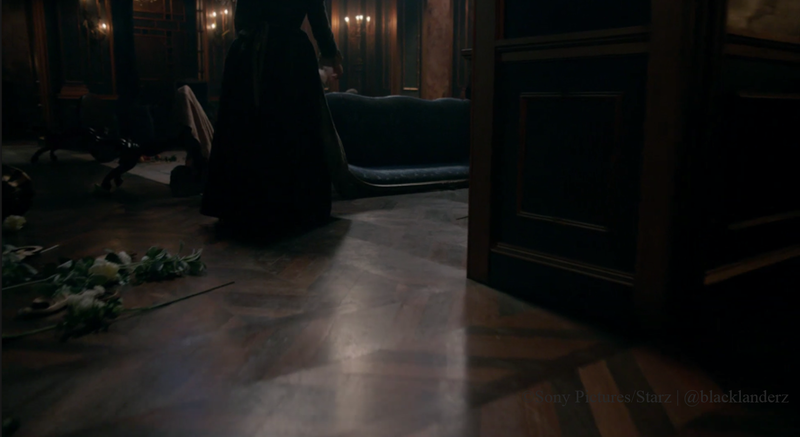 V: She doesn’t know that Claire doesn’t play – hell, she just needs to ask Laoghaire. And to see Claire become exasperated with the conversation and almost snap on ole girl was the moment I was waiting for. And yes, a slap to go along with it. I: Annalise seemed to also have a hard time believing that BJR could be taken with Claire. V: She did and was getting on my nerves. More so than that, when will Claire learn every time she goes where she is not suppose to go – outside on the grounds of Versailles – something bad happens. And that is exactly where the reveal of Black Jack Never Damn Goes A-W-A-Y Randall shows the hell up. The look of terror on Claire’s face stopped my heart! And, then again when Jamie shows up. I loved that Jamie was walking tall with his chest poked out, showing Black Jack that he didn’t break him – even though we all know he did. I: Good Lord, that meeting was tense. 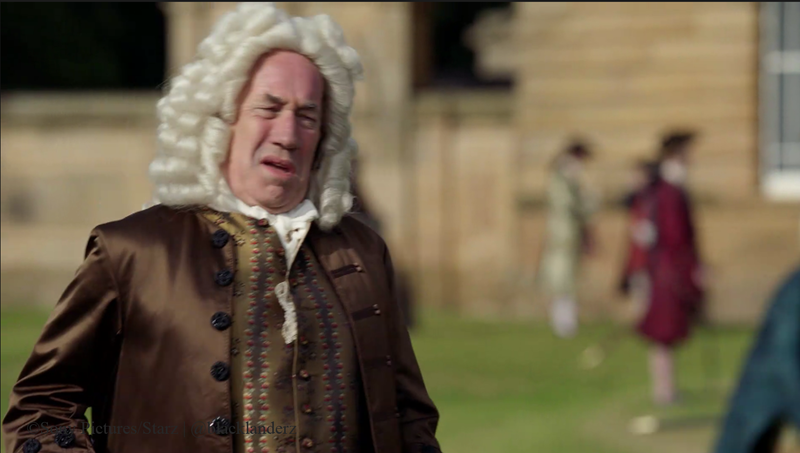 BJR’s prose of how the fates brought Jamie, Claire and him together at Versailles was delusional and his bowing to King Louis was so exaggerated. V: Well, you know he is demented, but he was acting a little too familiar for me taste. 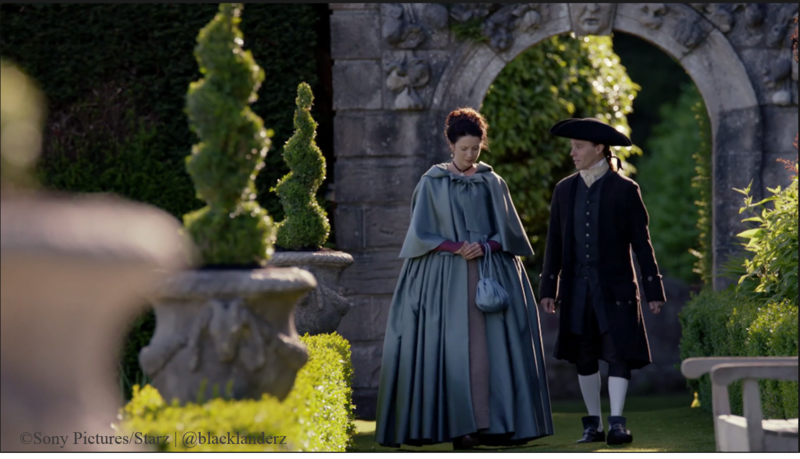 It surprised me that Claire never once thought she was the reason Black Jack was there. Perhaps, if she hadn’t interfered with Mary and Alex, and led Alex to believe his unemployment was a detriment to their relationship, there wouldn’t have been a reason for BJR to even be there trying to help get his brother’s job back. It’s a huge moment, and to see this red coat amongst the gardens. It was so, for me, visually evocative and really stirred up a lot of emotion in me personally, because I hadn’t seen it either since we’d done all those scenes. The whole idea of that first meeting is that they’re trapped in this situation where they can’t really do anything … because the king is there, so one wrong move, he’s so powerful, it could be very dangerous for them. It’s all very contained, but very interesting to see Jamie come out of it quite coolly and calmly, and ultimately he challenges him to a duel. At that moment, Jamie is in control of what’s happening to him — and that’s very rare, especially in Season 2, for him to be in control, so he’s elated. V: I found it ironic that Black Jack was the one on guard. 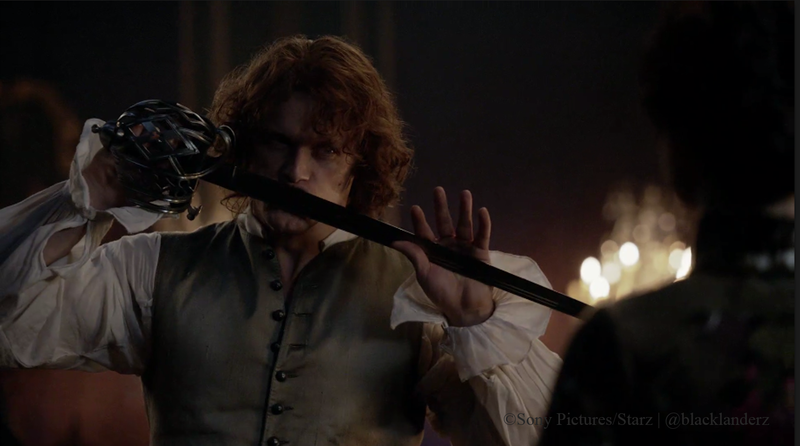 He had just told Claire drawing a sword in the presence of the King is punishable by death; and yet, when Jamie walks up, that is the first thing he does – places his hand on his sword. To do what? Stab Jamie? Wonder why you feel paranoid right about now, ole Jackie boy! I wanted it to be a different Jack, someone who’s slightly less confident as a result of the injuries at the end of Season 1 with the cattle – even though it’s ludicrous and a bit comic, I wanted it to be a real thing, that he had been physically diminished in some way. And also, he’s in a foreign country, a country the British are at war with — he’s not in control. Initially, some of the writing for him in that encounter was the cocksure Jack we knew from Season 1, and I was keen to change it up so he was less certain, so that you see the thrill and connection that he does feel with both Claire and Jamie, which is the thing that’s unnerving about it. You go, ‘how can he think of it like that?’ but he does, he feels a profound connection with them, but then he is in a situation where he’s not in control, and we’ve not really seen that. The rest of the [series], he’s in the bosom of the British army and has free rein. It’s an odd mixture of vulnerability and the raw connection of what they’ve been through. 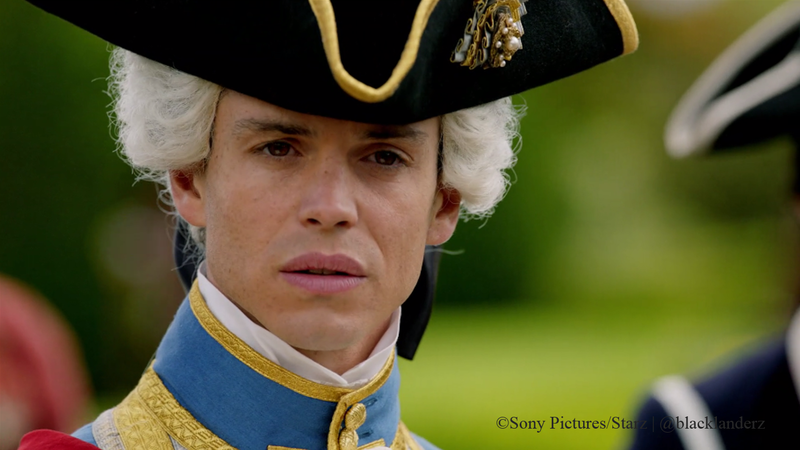 I: Thank God Claire was rescued by King Louis and his mockery of BJR. 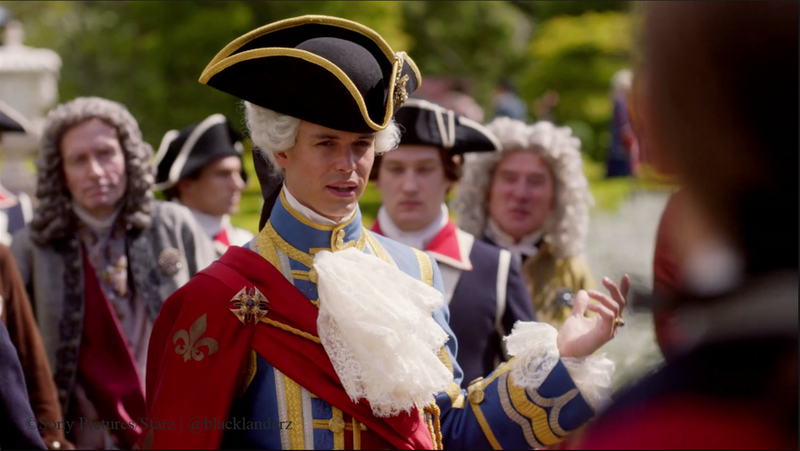 Even Jamie was able to enjoy BJR’s humiliation at the hands of King Louis and his court. V: That was a really brilliant scene. 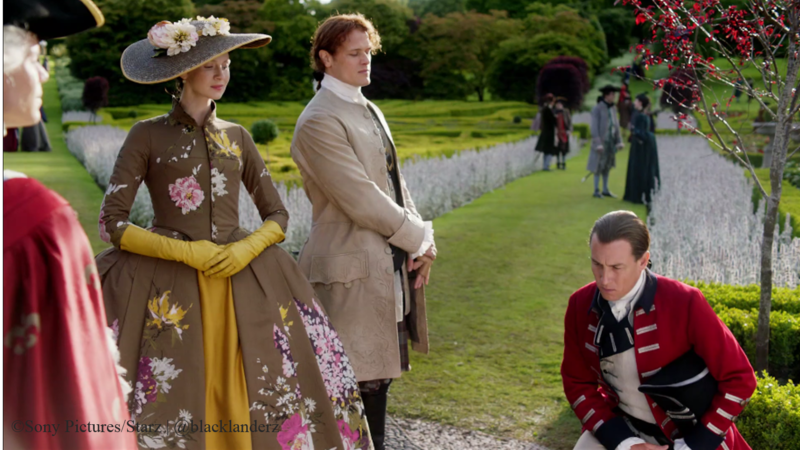 I so loved the King’s respect for Jamie and Claire, while he mocks Black Jack . . .
. . . ridicules the British for their war mongering – love of carnage, his pretty britches, and oh yes . . . I: Yes, indeed. King Louis threw shade at BJR giving him a little taste of the humiliation that he usually inflicts on other people. V: The last scene of the episode was by far the most painful, emotionally-charged moment to watch this season. 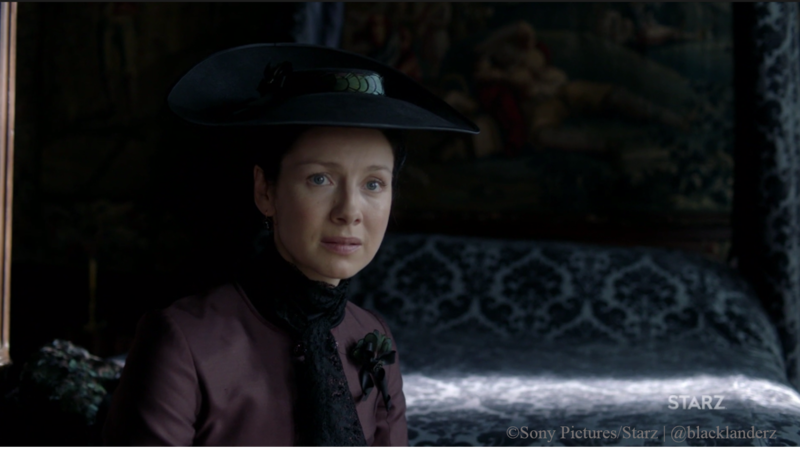 I hated how she spoke to Murtagh. I hope they reveal the real reason for them being in Paris to him next week. He’s waited blindly long enough. I: I was disappointed by her reaction too. 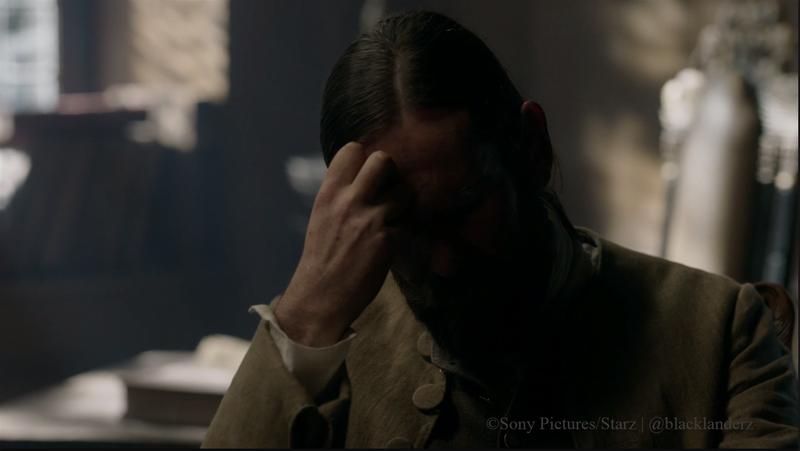 She continues to mistreat Murtagh and I don’t like it! 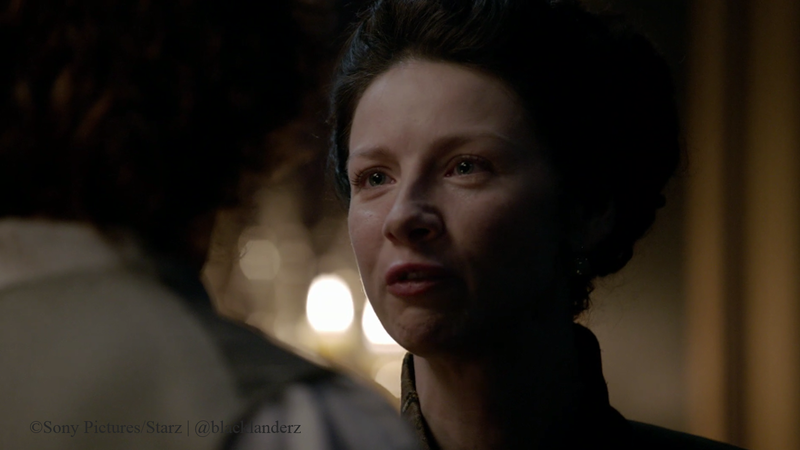 V: My heart broke for Jamie when Claire called in her debt. Though I understand why she did, I hated her in that moment for even asking him to hold of killing Black Jack for a year! It’s the pressure cooker that’s been building since Episode 1; they keep trying to come back together, they keep trying to be on the same team, but they’re not dealing with the core issues — and that’s that Claire feels abandoned by him, he feels misunderstood and alone, and so does she, and they’re two people who through lack of communication are on their own private islands. Claire has asked something insane of him, and it’s so much to ask and as Jamie says, it’s too much, and she realizes that, but she has a very sacred place in her heart for Frank and feels very strongly about trying to protect him, so it’s great stuff. 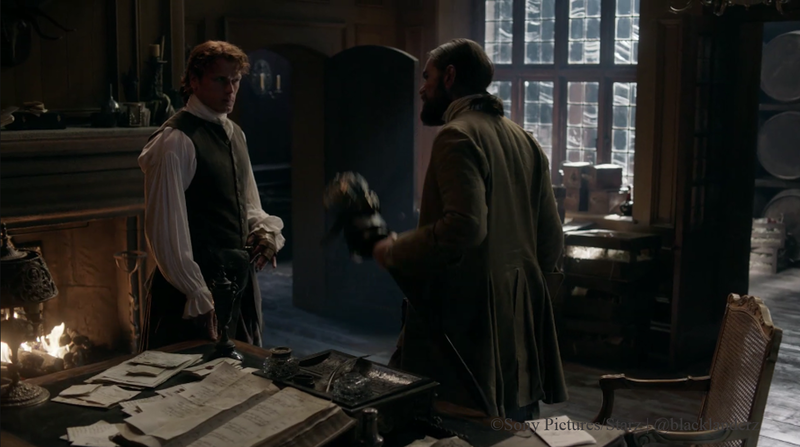 I: You know I’ve not read the books, so Claire swearing a charge against BJR to keep him from the dual with Jamie, although only a temporary solution, was genius. But then, she turns around and has the audacity to demand that Jamie not kill Randall to ensure Frank’s future by reminding him that she save his life more than once. Sorry, but I’ve got to stand with Jamie on this one. How much does she think one man, one mighty, mighty good man can take? Sheesh! James Fraser is nobody’s whore! Forgive me, but En Vogue’s What a man pops into my head every time I say good man. I can stand a lot more than most. I’ve proven as much! Why must I bare everyone’s weakness? Can I not have my own? Donas dubh nan seachd sitigean! You of all people couldna be asking this of me, Claire. You were there . . . you saw what he did to me. You may have yer choice. Him or me? I canna live while Randall lives. If you wilna allow me to kill him; then, kill me now, yourself. You owe me that much, James Fraser. I’ve saved your life, not once but twice. You owe me a life. I see. And, now you claim your debt. Jesus. You’d stop me from taking vengeance on a man that made me play his whore. A man that lived in my nightmares and in our bed. Almost drove me to take my own life. I’m a man of honor; I pay my debts. Tell me now. Is that what you’re asking of me? To pay you with the life of Black Jack Randall? 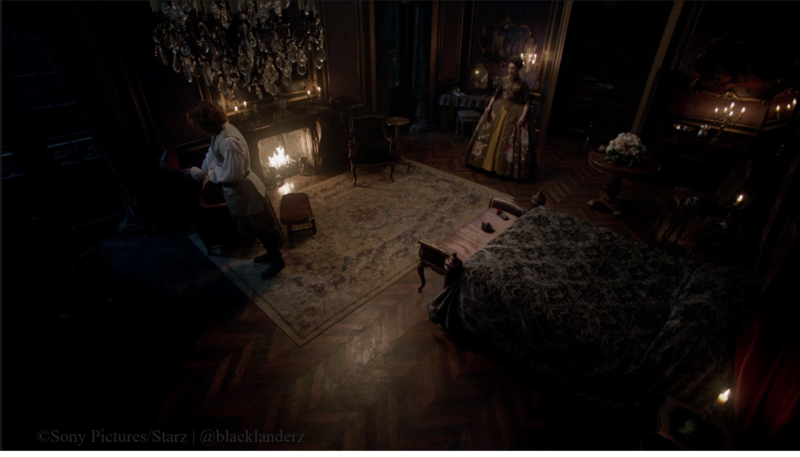 V: Poor Claire felt relieved that Jamie agreed to wait. But then . . .
. . . my heart just sank! Great ending with that aerial view of them in the room. Just masterful! Iris: More BJR! 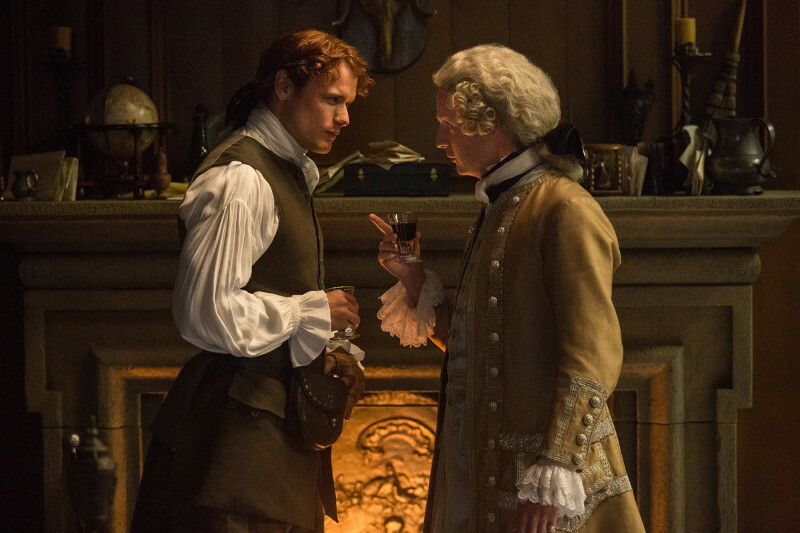 How Jamie makes peace with his promise to let BJR live another year. Answers to who is behind Les Disciples and why they attacked Claire, Mary and Murtagh. 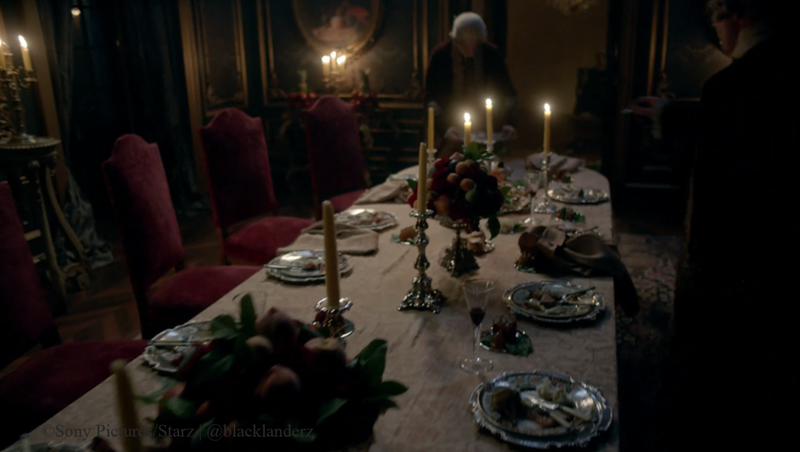 Claire and Jaime’s scheme to destroy the Comte’s wine and Fergus in action. Hopefully we will get to see Duverney and Louise too! Vida: I am looking forward to the duel between Black Jack and Jamie; Jamie’s confrontation with Comte St. Germain and how all of this will continue to plague Claire and Jamie’s relationship. Oh yes, I am also looking forward to seeing more of wee Fergus. This episode was an emotional roller coaster and the tension was so thick, you could cut it with a knife. Very character driven. For those reasons (and others), we give this episode five shots. 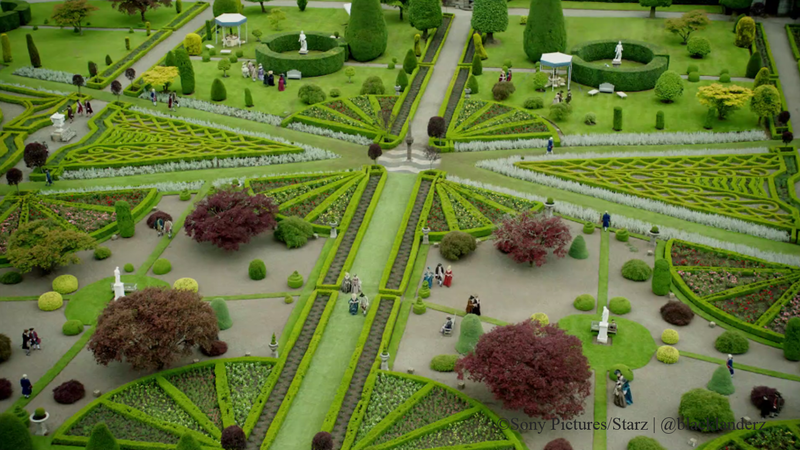 Versailles set the stage for a lot that will happen in upcoming episodes. There, we had tension between Claire and delusional/jealous Annalise; between Claire and Black Jack (thought we’d have a heart attack); then, between Jamie and Black Jack (little humor with the banter) and finally with Black Jack and King Louis – not to mention all the shade that went around. For this episode though, King Louis stole the show by humiliating the hell out of Black Jack and making him get on his knees. 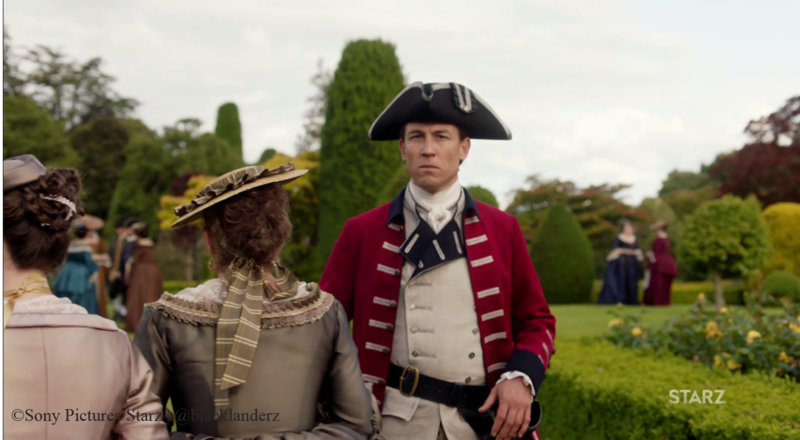 The total befuddlement on BJR’s face from the way the King treated Claire, praised her French to the way he respected Claire and Jamie as Lady and Lord was priceless. Sam and Cait’s performances were absolutely superb and heart-wrenching to watch. Sam’s performance of the betrayal, pain and hurt Jamie felt from Claire was so emotionally charged rendered us speechless. We must also add the directing by Douglas Mackinnon with those aerial shots was outstanding. 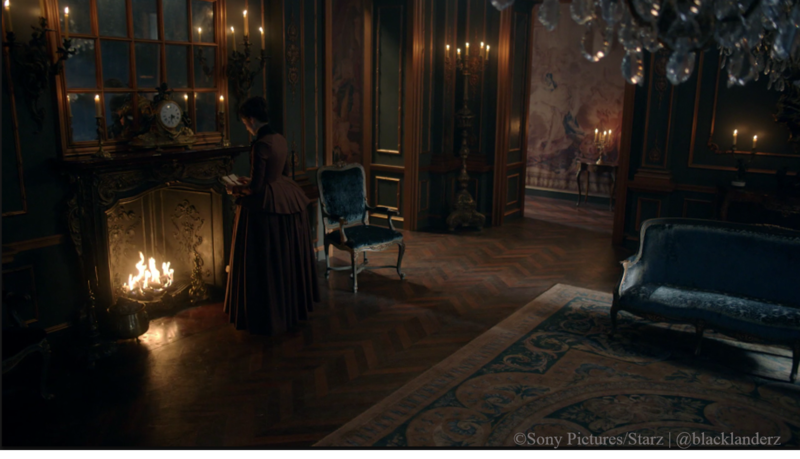 Jon Gary Steele’s set designs were more intricate and covered numerous locations – vastness of Claire and Jamie’s apartment, the details and added props for Jared’s wine warehouse, Versailles and the grounds. 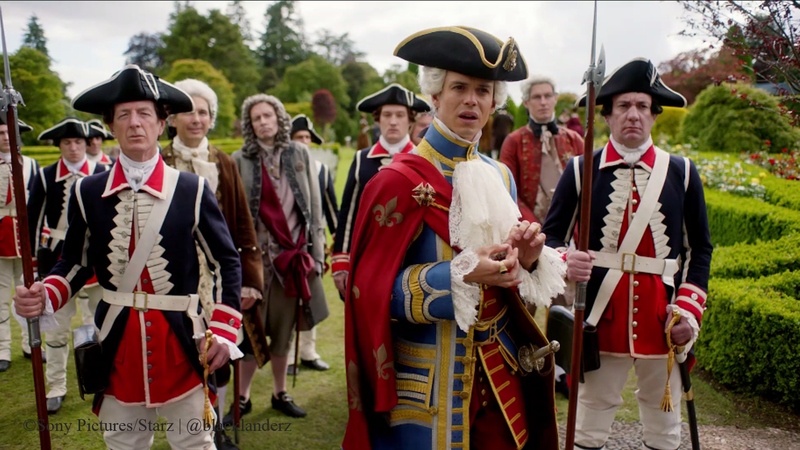 Terry’s costumes were worn by so many more extras this episode and we especially liked them putting Jamie back in a kilt. Bear’s music that was sweet, chilling and at times haunting moved the story along, and made our hearts stop a few times. 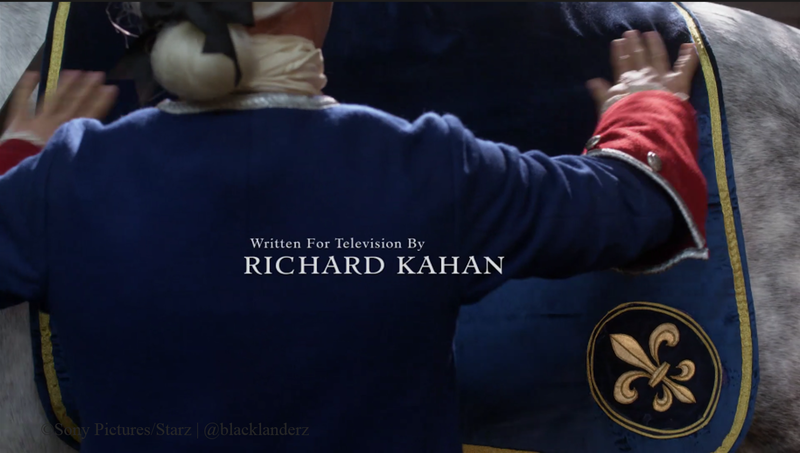 And last, but certainly not least, Richard Kahan’s writing such a complex episode that had every emotion possible pushed this episode to the highest number of shots we’ve given thus far this season. Make sure you follow him on Twitter: @RichardKahan. Jamie and Claire uses her medical knowledge to devise a plan to halt a deal that would fill the war chest; but, she learns Jamie has reneged on his word, and that leads to problems for both of them.